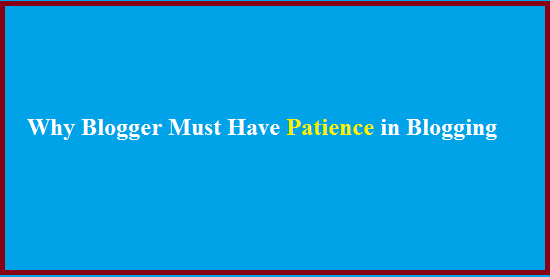 Okay, patience is one of the biggest thing in human life, to make life easier, smarter, Joyner. These things only and only possible, if you have patience, because it's all about experimenting and if you are doing experiment that means you have to give time to get result. I mean think about this if any researcher don't have a patience then how could be possible the researcher will find something new. We all are researcher want to find something new, which will make us popular money making blogger not in the country even in the world. This is our main motto right!!! Yes, this is true, because you are going to be live long time then you have to give time to make your identity in the internet, you need good hosting, theme and even good writing skills so always try to improve yourself every day, you can try IO Zoom for hosting, you can get discount here IOZOOM Promo Code. Because people are not going to read your blog daily for free, until or unless you are not going to share important things and true things with them. No matter what topic you are going to share with the people 99.9% times you will have competitors , then to know your competitors and make your brand impression better than your competitor you have to give time. And more time, it's mean only one that is patience. This is online, billion of people are using internet every day, yes every day. What does that means, you have opportunity to make billion dollars every day but it is not easy, not even impossible, remember whenever you will split impossible it becomes "I am possible". You need time to get result, what you are doing today at least in the early of blogging because in the starting blogging only few ways to get traffic but search engine is not going to help you that much. But later your best friend will be Google, Yahoo, Bing, Ask and Social medias too (Facebook, Twitter, Google Plus). This is really different from online business, how ? Because in offline business you will get result what you are doing now, but online it is different, you are not going to result today what you are doing today but of course, you will get result with complex and complex interest later. You have to be continuous, means not only in blogging, in every field of our life, we must improve our self continuously to get succeed. Be continuous and never give Up! This will make you one day some one else!! Why I am saying all these, because I have been blogging from last five years and of course without having any mentor and did not find out anyone to follow properly, that's why I have created this blog to help others those wanted to get success through blogging [Motivation Required in Blogging] in very short period of time. These days, I am managing multiple blogs including a Youtube channel, especially with my Youtube Channel is rocking and I am planning big with it, because I am targeting all engineering students, actually I am updating this section today My YouTube channel is the biggest one in India for GATE Mechanical- YouTube.com/ujjwalkumarsen, okay that is different matter, but today I am talking about getting motivation to keep blogging is the best way to get success. These three factors are most important for getting success in e-business, its takes time to get success, most of time people started without knowledge and wanted to get success over night so my suggestion for you is that you must have a mentor, if you have money then hire someone who will monitor your steps, this is one of the best way to get success. My father said to patience is every thing!! he has given me as example if doctor will not have patience to do operation, then how could be possible for successful operation. So, be patience in life as a blogger, as a student, as a father or may be what you are!!! !